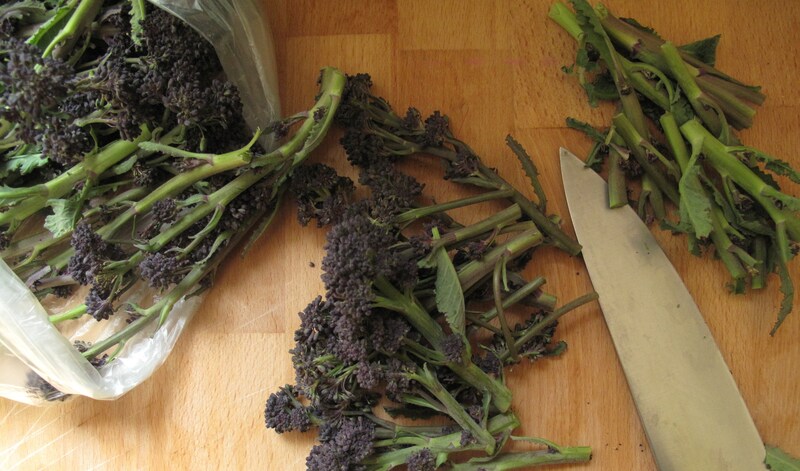 This week a variety that takes us out of winter eating and towards lighter summer fare – purple sprouting broccoli. It’s a variety that says yes, the seasons are changing you will not have to think about new ways to deal with root vegetables forever. Yay! Summer is on the way. So what is it? Well, it’s broccoli but better. More delicate and refined plus it’s a gorgeous purpley-green colour. Actually you also have the regular kind in your bag this week too. I only got the call about the sprouting kind at the last minute. Usually I have to stalk suppliers for weeks on end for it so I couldn’t say no. As always with this type of thing simplicity is the way forward. Going fancy just misses the point. Steamed and tossed in butter or olive oil with maybe a spritz of lemon is a great place to start. With a bowl of quinoa this makes a beautifully simple lunch. A little sautéed garlic, chilli maybe some tangy Parmesan or Pecorino are also good foils. Add some pasta and you’ve got one of those gorgeously understated dishes which, baby Lee permitting I’ll be making (or bullying someone else into doing it for me) this evening. 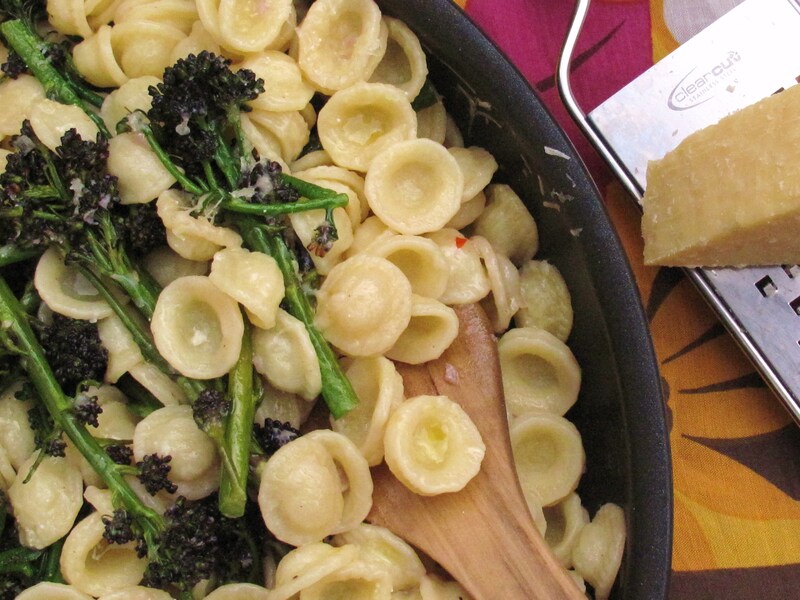 Orecchiette (literally babies ears) from Puglia would be my pasta of choice for this kind of dish but it’s up to you. Unless you stop to feed a baby about 10 times this will be ready in ten….. Put the kettle on for the pasta and sort through the broccoli trimming the tougher stalks. You don’t need to cut it unless stems are really big. Place in a steamer until tender but not soft then remove and set aside. While the broccoli is steaming put on the pasta. 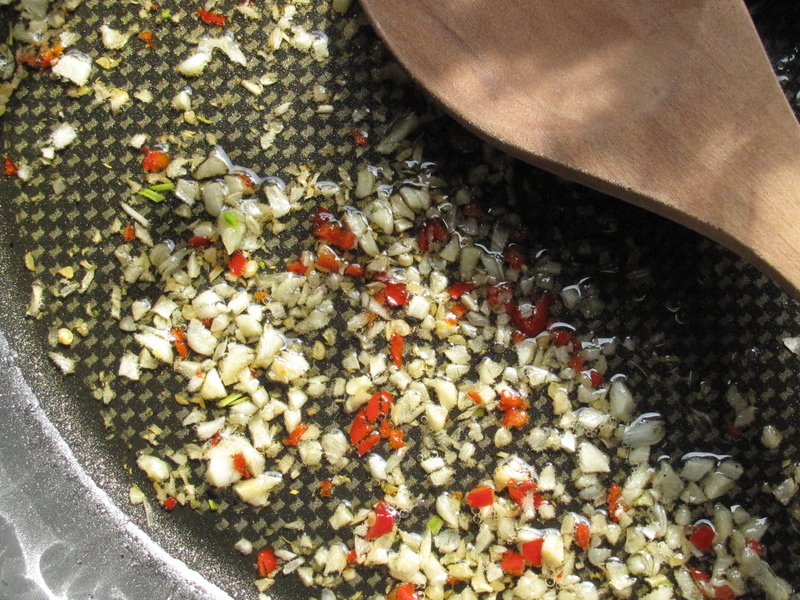 Heat a generous glug of olive oil on a pan and gently sweat the garlic and chilli until soft. Add the broccoli and toss everything together. Early broad beans are another sign of summer. They are another variety that cry out for a simple approach. The recipe above can easily be made with them but they are also great in salads. Check out my recipes for a warm salad with Serrano ham or with star-anise infused cous cous with blood orange (they’ll be gone soon so look smart!) and feta. The gnarly beast in your bag is celariac. Like all roots it can be boiled, mashed and roasted. It also makes great soup. I’ll be having it crushed with potatoes topped with crispy onions and fresh green chili – yum! Rhubarb is now in season!!! We’ll be getting some in from Wicklow next week.If you’d like a bunch give us a shout.It’ll be €2.75 a bunch. Get ready to crumble! 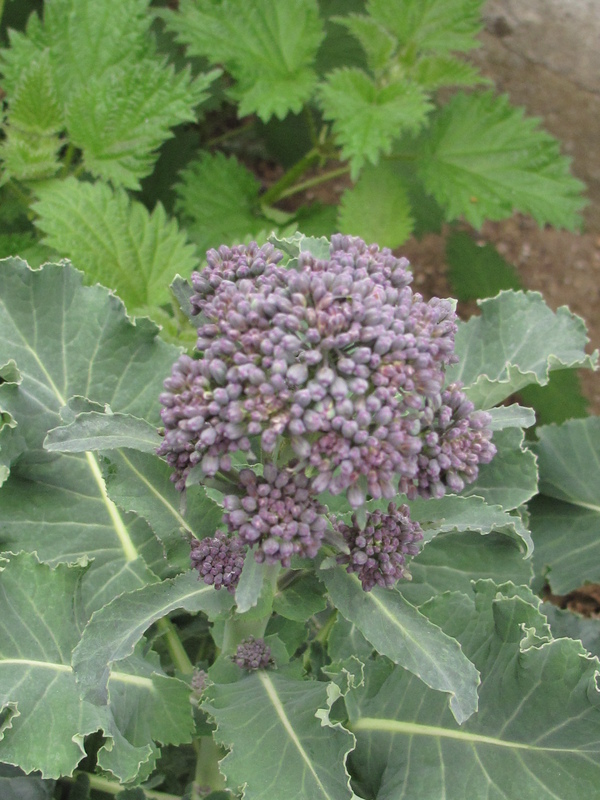 This week we have one of my most favourite things in the world – purple sprouting broccoli (in all the bags) so if you’re planning on entertaining at home this week get ready to impress! 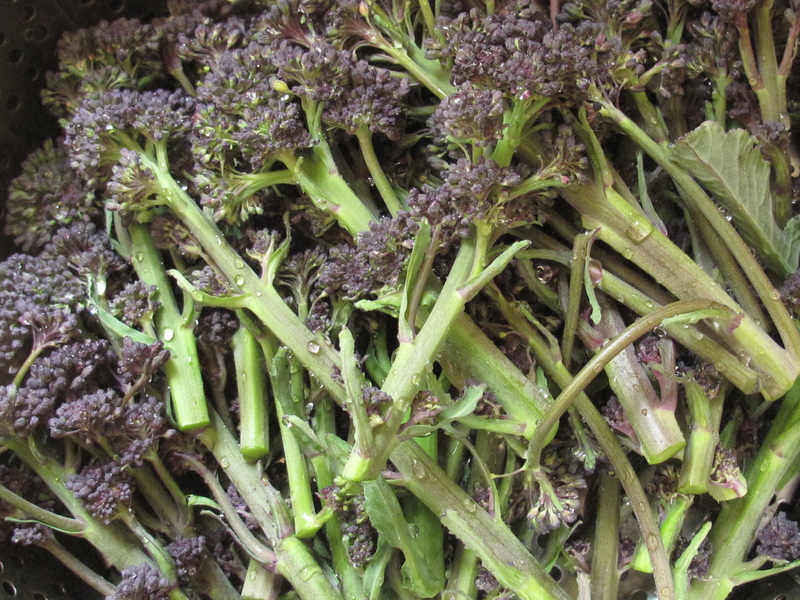 Purple sprouting broccoli is a rarer variety of the more typical kind and it’s very special. As well as being lovely to look at (makes a lovely centre piece for any dinner table) it’s deliciously tender and like all broccoli, is a superfood to boot. 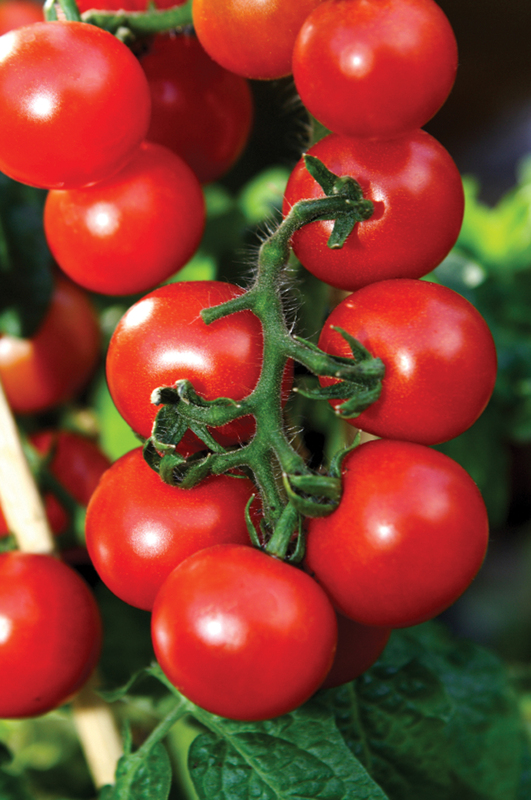 You can eat almost all of it – you only need to discard the bigger leaves and trim the tougher stalks. Like all special varieties simplicity is the best way to go. Steam it and serve dressed in sea salt and your finest olive oil or some melted butter. If you want to go all out make a Hollandaise sauce. I have two favourite ways to prepare it. One is very easy – steamed then pan-fried with bread crumbs. Very simple and really delicious. The other way is a bit more complicated. I grill a piece of soft goat’s cheese (Chevre) on top of a slice of polenta then top it with a sundried Tomato Pesto and the stems of broccoli. It’s a real treat. There’s about 350gr in your bag and each recipe needs about 150gr so you can try them both. Be sure and cook it very soon though as it’s at its best now. Wash the broccoli and break it up into large bite-size pieces. Steam for about 3 minutes until tender but not soft and mushy – you want some bite. Heat about 1 tablespoon of olive oil and a knob of butter in a pan then throw in 2 scant tablespoons of breadcrumbs. Allow the breadcrumbs to turn a pale golden brown but be careful they don’t come anywhere near burning then throw in the broccoli. Toss for about 2 minutes then serve immediately with a little Sea Salt. Pan-fried Purple Sprouting Broccoli with Polenta, Goat’s Cheese and Sundried Tomato Pesto. Start by making the pesto – place all the ingredients except the Parmesan in a blender then blast until smooth. Stir in the Parmesan then taste and correct the seasoning if necessary then set aside. Prepare the purple sprouting broccoli for cooking as described above leaving the stalks a little bigger than before and set aside. Cook the polenta as per the instructions on the packet – they all seem to vary so do read the packet. I used an organic one from Biona and it cooked very quickly. The whole thing took 15 minutes – 5 minutes stirring then 10 resting in the pot. When it’s ready, spread it out on an oiled tray about 2 cm thick then set it aside to cool. To put the dish together cut the polenta into 2 squares or rectangles then top with a round of goat’s cheese about 1cm thick. Steam the broccoli as described above and when it is done place the polenta and goat’s cheese under the grill and toast until golden. While the cheese is toasting, heat a little olive oil on the pan and toss the broccoli over a medium heat for a minute or two. Just before you take it off turn up the heat slightly and add a dash of Balsamic vinegar. Toss quickly then remove from the heat. Season with the tiniest pinch of Salt. To finish things off place a generous dollop of pesto on the cheese then top with the broccoli stems. Garnish with a few toasted pine nuts if you’re feeling that way inclined but don’t worry if you’re not. You can bulk things up by adding this week’s lambs lettuce with a drizzle of Balsamic. Just put it on the pesto before you add the broccoli. This week’s spinach is supertender and gorgeous in a salad – try it with walnuts and goat’s cheese and a balsamic dressing. Or you can have it wilted on toast with poached eggs tomorrow morning …. This week’s salad leaves are the aforementioned lamb’s lettuce and they are gorgeous especially with avocado. If you’ve got Asparagus they are great in the polenta and goat’s cheese recipe above although you may want to save them for the BBQ – roll on the weekend!!! !